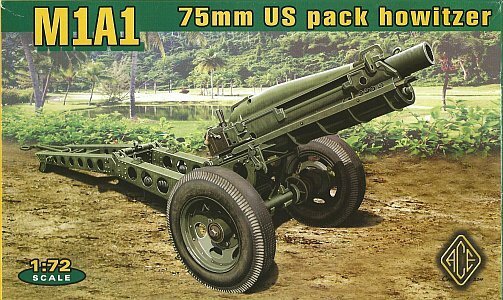 Conceived as a lightweight artillery piece, and adopted for use by airborne units, the M1A1 pack howitzer was introduced in 1940. 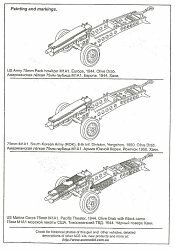 It continued in service long after WWII, eventually being redesignated as the M116. 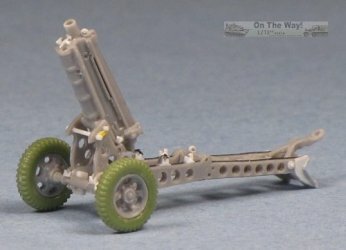 The term pack howitzer refers to the capability to break the weapon down into multiple loads, each small or light enough to be transported by a pack mule or horse. 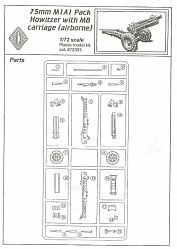 Inside ACE's standard sized and colourfully illustrated box, one finds a single small sprue of 24 grey injection moulded parts. 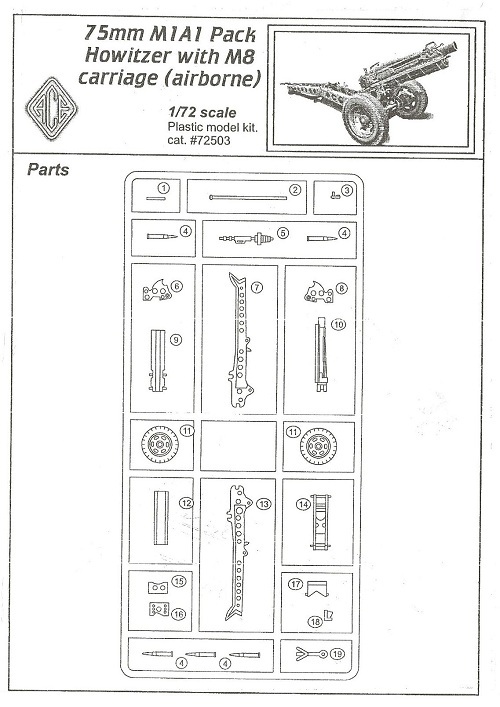 Though obviously produced by a limited run process, I was generally impressed by the level of detail on the parts. Some flash is evident, and most of the lightening holes in the trail and mount will require cleaning out. 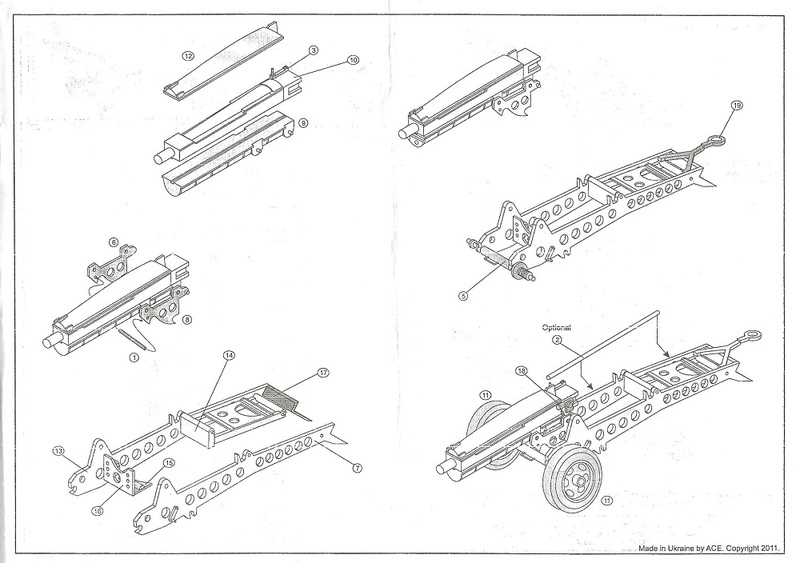 The trail parts also show some shallow sink marks. Assembly looks relatively straightforward, though all the parts will need some careful clean-up. There's plenty of room for detailing, and the box art shows some details not captured in the kit, such as the recoil springs located inside the hollow trail arms, the open lifting lugs on the top barrel sleigh, and the lifting eye near the end of the barrel. 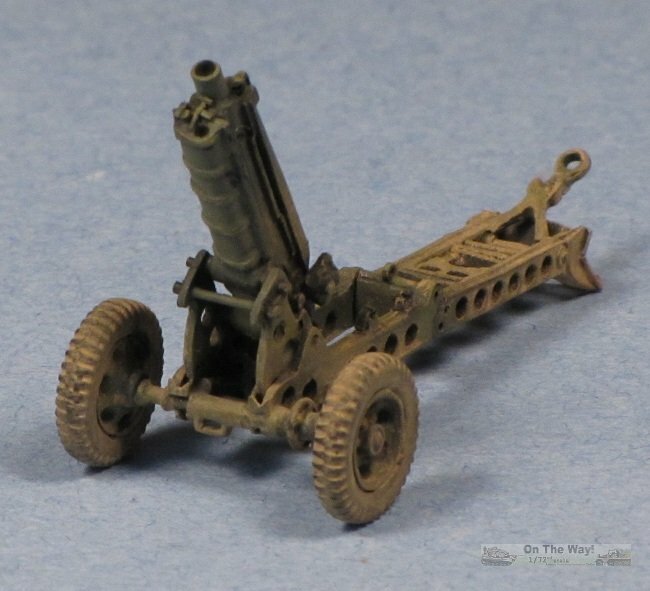 Looking carefully at the box art, one can make out rifling in the mouth of the barrel - this is not correct. 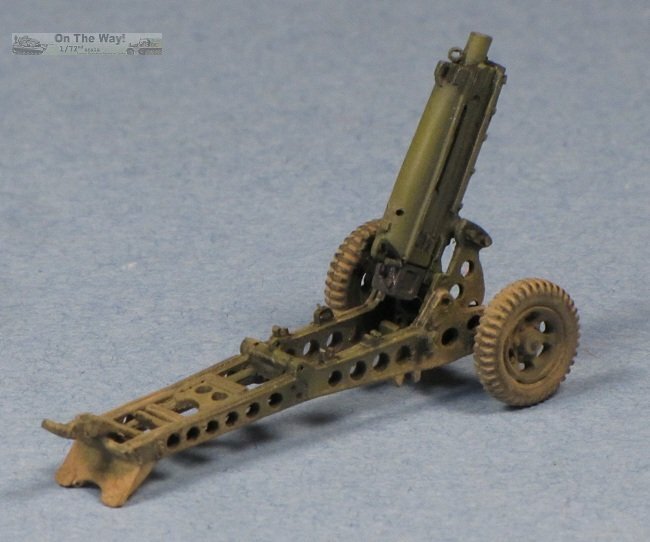 The end of the barrel is actually a hollow sleeve, with muzzle of the rifled barrel actually located several inches into the sleeve. Something to bear in mind if drilling out the barrel. 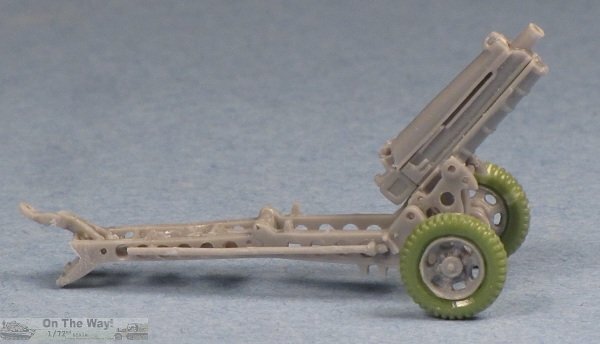 A nice touch is the inclusion of five 75 mm shells. One area I was a little disappointed with are the tires. These look to represent civilian pattern tires, which were fitted to many pack howitzers. However the moulding leaves the outer surfaces of the tires practically bald of detail. 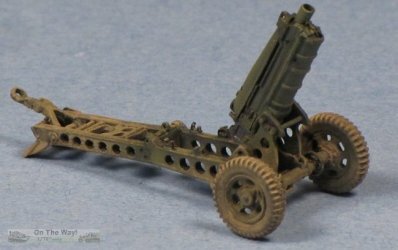 I feel that the military non-directional tread pattern would have been a better choice. 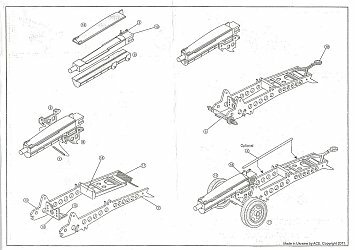 Instructions consist of a parts diagram, five exploded-view diagrams, and a painting diagram. 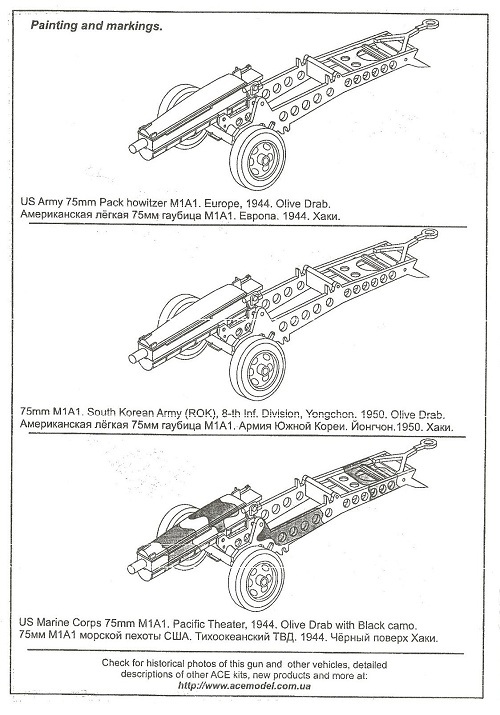 Three schemes are illustrated - US Army, Europe 1944 in overall olive drab, 8th Infantry Division, South Korean Army, Yongchon 1950, also in overall olive drab, and US Marine Corps, Pacific theatre 1944, in olive drab with black camo. No decals are provided. The kit is really quite nice. 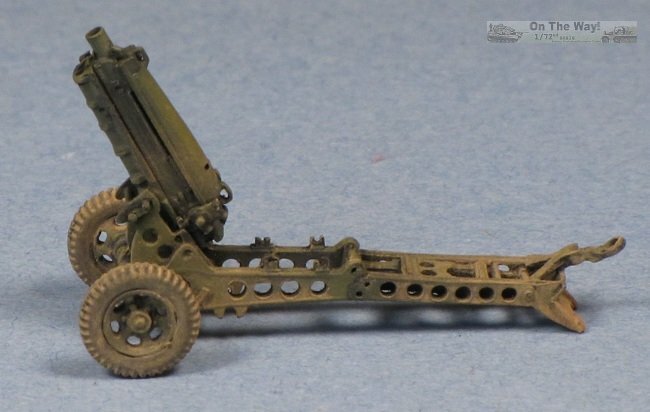 All the parts require cleanup, as is to be expected, but the detail is nicely done. 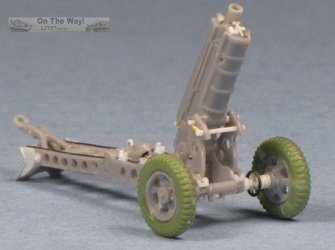 The main improvement I've made was replacing the kit tires with Airfix jeep trailer tires. The kit parts suffered from very faint tread. I also drilled out the front and rear lifting handles on the upper sleigh, and drilled out the muzzle. I added lifting eyes to the barrel, breech and trail, along with the mounts on the trail for carrying the barrel in the stowed position for travel. I added the prominent weld bead to the top and bottom of each of the trail sides, and added detail to the recoil spade. 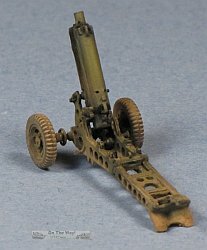 The ACE kit provides a separate operating lever for the breech, shown installed on top. In fact, the breech lever is recessed into the side of the breech when closed, and only the handle and the pivot point are exposed. I also tried to depict the mount for the sight (the kit is a bit vague on where this should go). 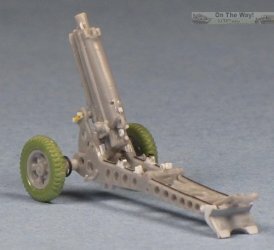 The pack howitzer had an interesting system for traversing the gun - a handwheel was mounted on the axle, which engaged a jack screw that would slew the gun from side to side. 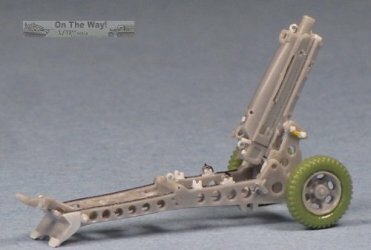 I ended up rebuilding part of the axle to better depict this, adding a wire handwheel and simulating the cloth boot using a stack of punched plastic disks. I also added the elevation gearbox inside the mount. Painting was accomplished with multiple heavily thinned coats of Model Master Olive Drab, mixed with progressively more Radome Tan, applied over a flat black base. This was followed with a little bit of pin washing, some selective drybrushing, and a filter of Vallejo grey-green mixed with khaki. Finally some Mig dried mud pigment applied both wet and dry. This was a really fun little project. 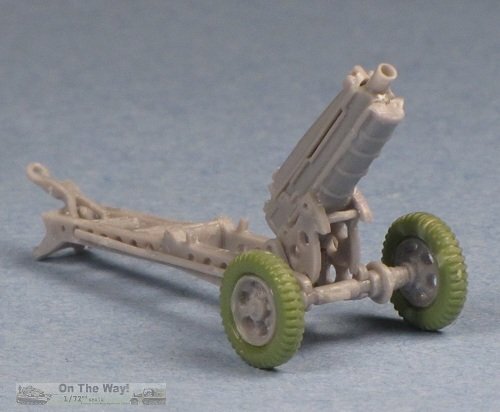 I'd be curious to see how the new Airfix Pack howitzer compares. 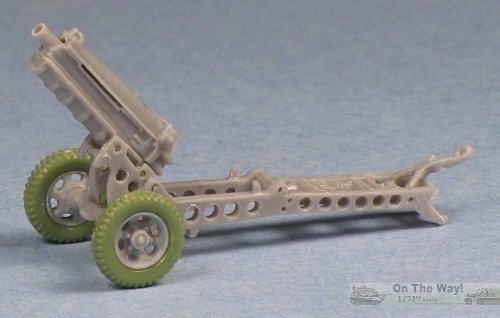 My only complaint is that ACE didn't depict the equilibrator springs that should be visible through the lightening holes in the forward part of the frame. I couldn't come up with any easy way to put them in myself.